Thanks to persistent efforts by Delaware's congressional delegation, the crumbling breakwater under Harbor of Refuge Lighthouse is about to get some long-anticipated repairs. Lead by US Sen. Tom Carper in the Senate and US Rep. Mike Castle in the House, with support from US Sen. Joe Biden, initial funding for the much-needed work is now available and waiting to be spent. Sen. Carper announced the funding at a press conference Jan. 8 in the dining room of the Cape May-Lewes Ferry terminal where attendees could look out across the harbor and see the lighthouse perched astride the massive breakwater. Rep. Castle; Lewes Mayor Jim Ford; Major Patricia Arcari, Deputy Commander for Philadelphia District Army Corp of Engineers; the Corps' Harbor of Refuge project manager Charles Myers; Delaware River & Bay Lighthouse Foundation President Judith Roales and other members of the Foundation board; and Larry Sharp of Delaware River & Bay Authority were on hand for the event. Sen. Carper spoke about the significance of the breakwater and the lighthouse in Delaware's history and of their importance in the present-day tourist economy of Lewes and Sussex County. The breakwater is also a key part of the National Harbor of Refuge Historic District recognized by the National Register of Historic Places, he said. The district, 24.300 acres in size, includes both Harbor of Refuge breakwater and the older Delaware Breakwater, Harbor of Refuge Lighthouse, Delaware Breakwater East End Lighthouse, all the other navigational lights on the two breakwaters, the anchorage behind the breakwaters, and the old lifesaving station now used as a headquarters by the pilots association. Sen. Carper praised Foundation members for their work in preserving the lighthouse and their efforts to bring attention to the condition of the breakwater. He pointed out that the original purpose of the breakwater was to provide a safe harbor where up to a thousand sailing ships could be protected during storms. It saved many lives and fortunes in maritime cargo. But today, Rep. Castle added, it protects the Sussex shoreline from the ferry terminal south to the tip of Cape Henlopen. A breach in the breakwater could cause serious environmental changes, he speculated. This year's funding -- $343,461 -- goes to the Army Corps of Engineers, which owns and maintains the breakwater. It will pay for a serious study of problems at the breakwater, the development of plans, and (with luck) some actual work to protect the lighthouse, according to Myers. Myers and Foundation members will meet within the next few weeks to get the project rolling. The mile-and-half long breakwater was built by the Army Corps of Engineers between 1897 and 1901. "In spite of the breakwater's current problems, the fact that it's 110 years old tells you something about the quality of the Corps' work," Roales told the gathering. "It's remarkable that there's anything there at all given the harsh location at the junction of the Atlantic Ocean and Delaware Bay." The lighthouse sits on the southern end of the breakwater. When the first Harbor of Refuge Lighthouse was constructed there in 1906-1908, rock was excavated from the breakwater to a depth of 15 feet and the iron caisson was sunk into the breakwater hole. Cement was poured around the outside of the caisson, and rip-rap was piled atop that. The lighthouse was built on the caisson. In 1926, after the old lighthouse was destroyed by storms, the current lighthouse was built on the same caisson foundation. 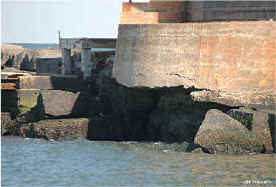 In the late 1930s a concrete "collar" was constructed on top of the breakwater to surround the lighthouse and further stabilize it as the breakwater began to deteriorate. A Corps study in 1970 documented more deterioration but concluded that a "shelf" of the breakwater still existed and was protecting the lighthouse. In 2004, the Corps conducted a side scan sonar study of the breakwater around the lighthouse and determined that a serious number of cap stones from the breakwater had been washed to the bottom of the bay, as much as 120 deep in spots. The Corps estimated that repairs could cost from $1.5 million to $10 million. The lower estimate will solve the problem if the stones are just being washed from the top of the breakwater. The higher estimate will be required if the stones are falling from the top because the bottom of the breakwater is washing away. This year's funding will allow the Corps to identify the basic problem and develop plans for a solution. The congressional delegation has asked for an answer and estimated funding requirement by May so that money for actual work can be requested in the next federal budget cycle.